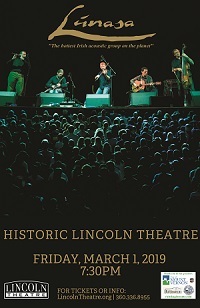 Named for an ancient Celtic harvest festival in honor of the Irish god Lugh, patron of the arts, Lúnasa is indeed a gathering of some of the top musical talents in Ireland. Its members have helped form the backbone of some of the greatest Irish groups of the decade. Advance Reserved Seating Tickets: $35 1st Section; $30 2nd Section; $25 3rd Section; $20 4th Section + applicable fees. Lincoln Theatre Members receive $2 off.